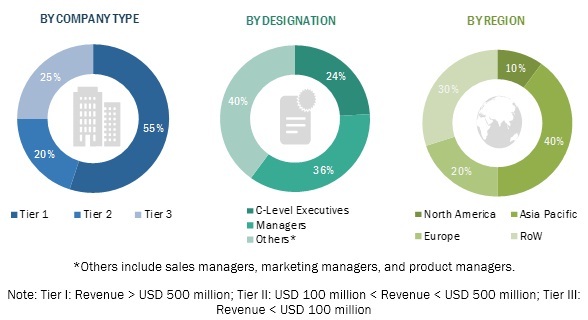 [208 Pages Report] Feed packaging market is projected to grow from USD 13.8 billion in 2018 to USD 17.8 billion by 2023, at a Compound Annual Growth Rate (CAGR) of 5.2% during the forecast period. The study involved four major activities in estimating the current market size for the feed packaging market. Exhaustive secondary research was done to collect information on the market as well as the peer and parent markets. The next step was to validate these findings, assumptions, and sizing with industry experts across the value chain through primary research. Both the top-down and bottom-up approaches were employed to estimate the complete market size. Thereafter, market breakdown and data triangulation were used to estimate the market size of segments and subsegments. In the secondary research process, various sources were referred to, so as to identify and collect information for this study. These secondary sources included reports from the American Feed Industry Association (AFIA), European Feed Manufacturers' Federation (FEFAC), and EU Association of Specialty Feed Ingredients and their Mixtures (FEFANA); annual reports; press releases & investor presentations of companies; white papers; certified publications; articles by recognized authors, packaging safety regulations, feed safety organizations, regulatory bodies, trade directories, and databases. Secondary research was mainly used to obtain key information about the industry’s supply chain; the total pool of key players; market classification; and segmentation, according to industry trends to the bottom-most level; and regional markets. It was also used to obtain information about the key developments from a market-oriented perspective. The overall feed packaging market comprises several stakeholders such as feed traders and distributors, pet food traders and distributors, animal feed and packaging regulatory bodies, manufacturers of feed packaging, manufacturers of pet food packaging, pet food packaging material distributors/suppliers, livestock feed packaging material distributors/suppliers, technology providers to feed packaging companies, environmental protection bodies, and regulatory bodies in the supply chain. The demand side of this market is characterized by the development of the feed industries, the rise in livestock population, and an increase in pet adoption and humanization. The supply side is characterized by advancements in technology. Various primary sources from both the supply and demand sides of the overall market were interviewed to obtain qualitative and quantitative information. The primary interviewees from the demand side include key opinion leaders, executives, vice presidents, and CEOs of the livestock feed and pet food industries. The primary sources from the supply side include research institutions involved in R&D to introduce new feed packaging; key opinion leaders; distributors; and livestock feed & pet food packaging manufacturers. The feed packaging industry’s value chain and market size in terms of value were determined through primary and secondary research. After arriving at the overall market sizes-using the market size estimation processes as explained above-the market was split into several segments and subsegments. In order to complete the overall market engineering process and arrive at the exact statistics of each market segment and its subsegments, the data triangulation and market breakdown procedures were employed, wherever applicable. The data was triangulated by studying various factors and trends from both the demand and supply sides of the feed packaging industry. The market size was validated using the top-down and bottom-up approaches. This research report categorizes the feed packaging market based on livestock, pet, material, type, feed type, and region. Further breakdown of the Rest of European feed packaging market into Spain, Belgium, the Netherlands, and Denmark. Further breakdown of the Rest of Asia Pacific feed packaging market into Indonesia, Thailand, South Korea, Singapore, and Malaysia. For this study, the feed packaging market is further bifurcated into pet food and livestock feed packaging. 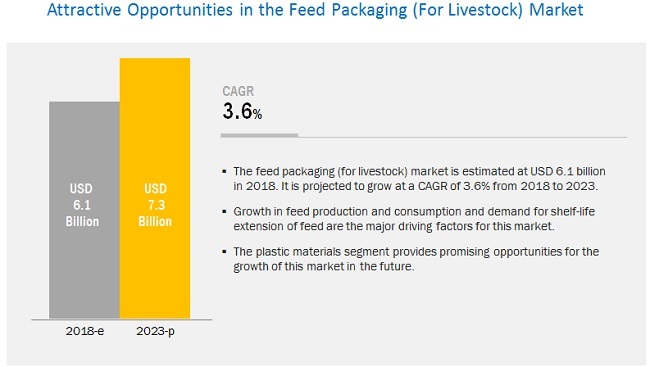 The market for feed packaging is projected to grow from USD 13.8 billion in 2018 to USD 17.8 billion by 2023, at a Compound Annual Growth Rate (CAGR) of 5.2% during the forecast period. This is attributed to the feeding of traditional dry farms leftover to the livestock in the developing regions. However, with the growing demand for quality livestock products and the increasing production of feed and feed additives, this market is expected to grow at a higher rate in the coming years. By livestock type, the poultry segment is projected to be the largest contributor to the feed packaging market (for livestock) during the forecast period. The estimated largest market share of poultry feed is attributed to the large-scale production of poultry feed. The large-scale production of poultry feed is a result of its large-scale consumption, as, unlike beef and pork, it is devoid of religious concerns. Thus, the production of poultry for meat is projected to dominate and account for more than half the growth of all the additional meat produced by 2025. Such rapid growth in poultry meat production is expected to further fuel the demand for superior-quality feed and feed additives, thereby propelling the market for livestock feed packaging. The dry feed type segment is projected to account for a larger market share during the forecast period. Feed packaging (for livestock) is widely used for dry feed type. Dry feed is available in the form of pellets, powder, crumbles, cubes, and cakes. It is a largely produced and consumed, globally. Most feed manufacturers in the market offer their products in the dry form due to its ease of usage, storage, and transportation. Moreover, dry feed is widely used in animal diets, as it is affordable in comparison with wet feed. Due to these factors, the segment is estimated to acquire a larger market share in 2018. On the other hand, feed packaging market (for pets), by feed type, is estimated to be dominated by the dry segment, in 2018, due to factors such as economical prices and product durability of dry pet feed as compared to other pet feed type. Asia Pacific is the major revenue generating region, in the feed packaging market (for livestock). The region is experiencing maximum developments in the feed production and packaging. With the rapid economic growth in the region, the demand for meat and dairy products is projected to increase, particularly in countries such as China, India, Japan, and Thailand for both domestic consumption as well as exports. This growing demand for meat and dairy products has led to an increase in feed production in the region. Due to these factors, the application of packaging has increased, and the livestock feed packaging market is projected to witness a healthy growth from 2018 to 2023. In addition, unlike developed countries, the livestock farm size in developing countries of Asia, including India, Thailand, and Vietnam, is quite small and the infrastructure for feed storage is poor. Due to these factors, farmers prefer buying feed in woven bags (25 to 50 kgs), as it prevents spoilage. Further, the growing animal husbandry practices, increasing awareness about the clean label products, and the growing demand for livestock products has encouraged the livestock rearers to buy well-packaged feed. These factors are expected to drive the growth of the livestock feed packaging market in the region. For the feed packaging market (for pets), Asia Pacific is projected to witness the fastest growth in the pet food packaging market during the forecast period. Pet food manufacturers in Asia Pacific are developing and launching new and innovative products that comprise various ingredients to cater to the diverse health requirements of pets. In addition, packaging is gaining significance due to marketing, labeling of contents, and packaging size. Moreover, packaging solutions such as small pouches are witnessing an increasing preference, which is encouraging customers to purchase new products. The major vendors in the global feed packaging market are LC Packaging (Netherlands); El Dorado Packaging Inc., (US); NPP Group Limited (Ireland); Plasteuropa Group (UK); NYP Corp. (US); ABC Packaging Direct (US); Shenzhen Longma Industrial Co., Limited (China); Amcor Limited (Australia); Mondi Group (Austria); ProAmpac (US); Sonoco Products Company (US); Winpak Ltd., (Canada); NNZ Group (the Netherlands); Constantia Flexible Group (Austria); and Huhtamäki Oyj (Finland). These players have broad industry coverage and strong operational and financial strength; they have grown organically and inorganically in the recent past. The industry players, such as Amcor Ltd., among other feed packaging manufacturers, are focusing on producing sustainable and environment-friendly packaging solutions. Moreover, key industry players such as Mondi, ProAmpac, LC packaging, Amcor Ltd., are adopting acquisitions as the key strategy to grow in the feed packaging market. Acquisitions have helped companies to expand their product portfolios and extend their geographical presence in developing markets. In August 2018, ProAmpac was awarded a Level-2 Food Safety Management Certification by the Safe Quality Food (SQF) Institute for its facility in Auburn, Washington, US. In June 2018, ProAmpac announced a launch of the no.2 Quadflex Pouch. This new pouch will provide synergies to its sustainable packaging solution for pet foods such as cereals and pet treats. In January 2018, Huhtamaki expanded its paper bag manufacturing operations in Poland by establishing a joint venture with Smith Anderson Group Limited (UK). Smith Anderson Group Limited is one of Europe's leading paper bag suppliers. Who are the major market players in the feed packaging market? What are the regional growth trends and the largest revenue-generating regions for feed packaging? Which are the major regions that are expected to witness the majority of the growth for feed packaging? What are the major types of feed packaging that are expected to gain maximum market revenue and share during the forecast period? Which is the major packaging material that will be accounting for the majority of the revenue over the forecast period? 16.2 EL Dorado Packaging, Inc.